Snow is a form of precipitation that falls from clouds. It has the form of snowflakes made from crystallized water ice. It is more present towards the northern and southern hemispheres and during the winter. Due to temperatures lowering with higher altitude, it is also found on mountain tops in regions where there is usually no snow at sea level. Snow occurs below the freezing point of 0°C (32°F) where there would be rain. 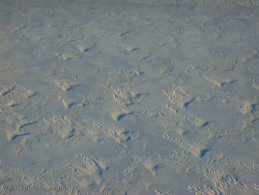 Large accumulations of snow can eventually create ice in the form of glacier. The Snow wallpaper gallery contains images or photos that can be downloaded for free and used as background on your computer, desktop or mobile device. The Snow wallpaper gallery contains 2 high quality wallpapers. This wallpaper gallery is a sub-gallery of the Element wallpaper gallery. 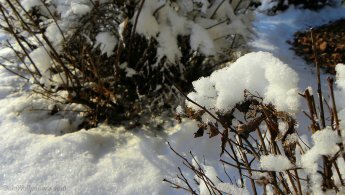 This gallery includes the following topics: Shrubs covered with the first snow, Snow dunes. All desktop wallpapers in the Snow wallpaper gallery are free for your personal use.